Madelynn Green ('15) recently graduated from the University of Notre Dame with a major in Political Science. She has spent years researching graffiti and street art across Europe, funded in part by Nanovic grants. 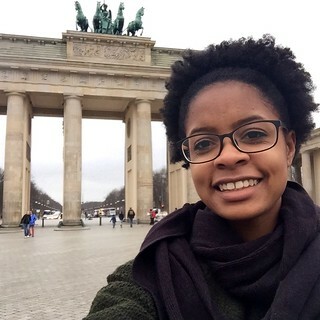 The last Nanovic grant that she received before graduation was a Senior Travel and Research Grant; she traveled to Berlin to study the connections between street art and urban development. What is the result of all of this research? Madelynn has a first-author publication in the Cornell International Affairs Review. She completed her senior thesis. And she was selected to be a Fellow in the New York City Urban Fellows Program, where she will continue working on urban policy and development. Where will your Nanovic grant take you? With the help of a Senior Travel and Research Grant, I traveled to Berlin, Germany to complete fieldwork for my senior thesis project titled “From Decay to Cool: Street Art and Urban Renewal in the East End of London and Kreuzberg, Berlin”. This travel grant was extremely valuable for my senior thesis research and I enjoyed experiencing the culture and language of Germany. In my project, I analyzed if there is a relationship between illegal street art and urban development. I examined this relationship in Berlin by surveying individual street blocks for neighborhood conditions and street art concentration. My fieldwork was well-complemented by educational visits to the Friedrichshain-Kreuzberg Museum (FHXB) in Kreuzberg, which offered impressive exhibits on the history of the historically impoverished neighborhood. At FHXB, I spoke with museum staff and saw highly detailed exhibits on Kreuzberg’s history. For example, the museum had a miniature version of the neighborhood with points of interest and historical events highlighted in the background. Overall, the most helpful exhibit was one where a map of Kreuzberg was painted onto the floor of a huge room. There were numbers on points on the map and each number-point (there were over 120) contained a personal anecdote from a resident of Kreuzberg. The tour was self-guided and the audio files were on an iPod. I think this exhibit really gave me a true sense of the neighborhood’s character, identity, and history. This valuable qualitative resource assisted me immensely as I wrote my thesis. Another helpful aspect of the museum was its special exhibit on Gorlitzer Park, a large park centrally located in Kreuzberg that has been plagued by violence and drug activity. This focused exhibit taught me how the park was conceived, developed and what its future holds. I visited the FHXB multiple times because of its wealth of information and friendly staff. One historian even took me out to lunch. Visiting the FHXB definitely filled gaps in my knowledge about Kreuzberg and was crucial to writing a well-rounded thesis and forming a sound comparison to the East End. I completed and turned in my thesis on April 1st. This research trip was invaluable to the in-depth analysis I was able to do in my paper. Thanks to my museum visits and observations, I was able to describe how Kreuzberg was established in the late 18th century for French immigrants and rapidly grew into a hub for industry in Berlin. Consequently, it was home to many poor immigrant families. During WWII, Kreuzberg was extremely damaged by bombing campaigns and spiraled further into destitution. Rebuilding from the war began in the 1950s and the construction of the Berlin Wall plunged the district into another dark period. During this period, Berlin was a peripheral and unattractive district of Berlin closed in on three sides by the Berlin Wall. As a result, its cheap rents and abundance of old factories made the area attractive to artists, students, punks, Turkish immigrants and countercultural groups in need of affordable housing. The traditional countercultural and immigrant character of the neighborhood endures today, but with real estate developers’ efforts to redevelop the neighborhood, rents are rapidly increasing and traditional residents are being pushed out. The future of Kreuzberg is uncertain, but for now immigrants and new, wealthier residents coexist. I was also able to visit the obligatory sights of Berlin, including the East Side Gallery, the TV tower and Checkpoint Charlie. However, my most memorable experiences were when I did neighborhood observations. Learning the history of Kreuzberg made walking down its streets much more meaningful. I will continue to focus on urban studies in the future. I was recently selected to be a Fellow in the New York City Urban Fellows Program, where I will work on urban policy issues in the City of New York government for nine months. After this, I hope to begin graduate studies in England, France or Germany, as I am currently learning German and French. I am incredibly thankful to the Nanovic Institute for supporting this project and helping me to unearth Kreuzberg’s transition from to decay to cool. Finally, I deeply appreciate the Institute’s generous commitment to my project since I began it my sophomore year. These experiences have changed my life and made me a better scholar and person.